January 1, 2019 Patcharin Amornvipas, M.D. Rich in all kinds of nutrients, widely available, cheap and delicious, Thailand’s local fruits are a boon to parents looking to keep their kids healthy. Find out which ones offer the biggest nutritional advantages. Pros: Thailand’s most popular fruit has plenty of vitamin C, A and beta-carotene, as well as a reasonable amount of fiber and copper. Cons: Mangoes are more calorically dense and higher in sugar than some other fruits. Additionally, some sensitive individuals experience a mild itching sensation after eating mangoes. How to use: Aside from the ubiquitous mango sticky rice, this fruit is great all over. Try cubing ripe mango and tossing it with lime, chili and minced red onion to form a sweet/spicy salsa. Blend it into fruit shakes or smoothies. Puree it into a smooth, fat-free sauce for ice cream or pancakes. Thai green mango salads are also terrific. Pros: If you can get your children to eat durian despite its pungent aroma, they’ll be getting a decent amount of vitamin C, plus a whole mix of B vitamins. They’ll also get a respectable amount of minerals like iron, magnesium, copper and manganese. It’s also exceptionally high in fiber. Cons: Durian is higher in sugar and calories than many fruits. There’s 150 calories in every 100 grams. How to use: Connoisseurs of the “King of Fruits” generally insist on eating it raw, which is the best way to take advantage of all the vitamins. Try serving it with sticky rice (like mango) or eating it by itself. Durian ice cream is also very good, although obviously not the healthiest way to indulge. Pros: Dragon fruit has some vitamin C and healthy monounsaturated fats from the seeds. It also has beneficial antioxidants, especially when eaten in its bright magenta form. Cons: Not many. Dragon fruit is low in sugar. It doesn’t have quite the nutritional punch of, say, raspberries, it’s a solid choice. How to use: Despite its gaudy appearance, this fruit has a very mild flavor. Try squeezing a little lime juice on top to perk it up. Pros: When fresh, this super tart/sweet fruit is high in vitamins A and C, as well as mineral such as iron, copper, magnesium and phosphorus. It’s also very high in fiber, thanks to the seeds, and potassium. Cons: Fresh passionfruit isn’t overly high in sugar (though it is on the sweet side), but it’s also served in extremely sugary juices or drinks. How to use: Skip the processed versions and add spoonfuls of fresh passionfruit to smoothies to boost their flavor. Pros: High in vitamin C, vitamin A, lutein, B vitamins and fiber, guavas are often called a “superfood.” They also contain beta-carotene and more potassium than bananas. The red ones even have double the lycopene of tomatoes. Cons: Virtually none. On top of being crammed with nutritional value, these little gems are low in calories. How to use: Try to get your kids to eat green guavas without the sugar dips that Thais so often use. Guava juice (try a sugar-free brand like Ceres, available at Villa Market) is a great way to get most of the benefits as well. Pros: These fruits are relatively high in potassium provide some fiber. They also provide a creamy, sweet texture with very little fat. Cons: Bananas are low in vitamins and relatively high in calories. In Thailand, they’re often served battered and deep-fried or doused in a sugary sauce. How to use: Try grilled bananas (not brushed with sugar syrup) or eat ripe ones with peanut butter for some extra protein. Mashed, they make a great substitute for some of the fat in baked goods. Try freezing chunks of peeled banana then throwing them in the blender. They make a surprisingly great low-calorie ice cream substitute. 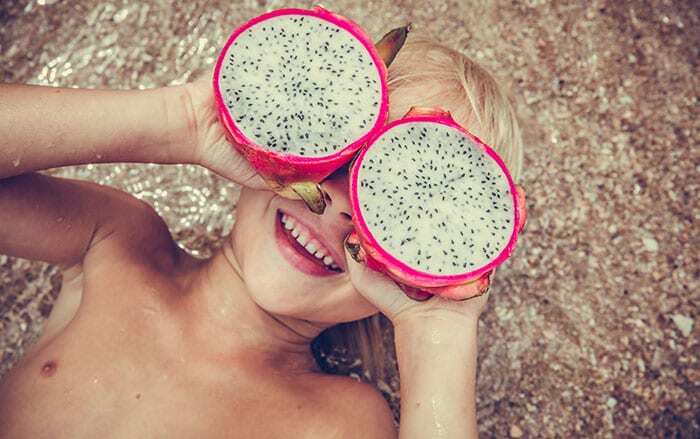 The Health Benefits of Thai Fruits Part 1 Rich in all kinds of nutrients, widely available, cheap and delicious, Thailand’s local fruits are a boon to parents looking to keep their kids healthy. Find out which ones offer the biggest nutritional advantages.